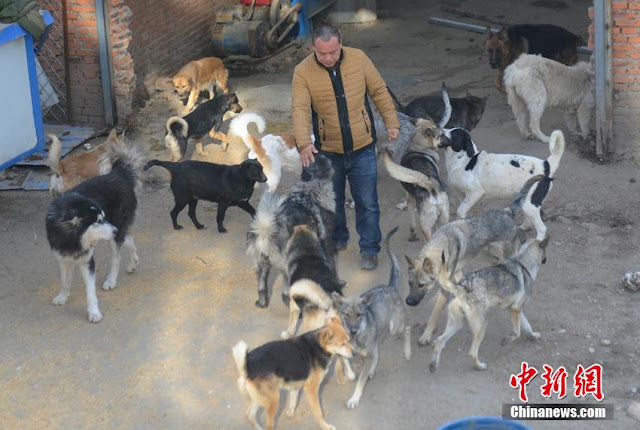 White Wolf : Chinese man spends $400K to buy Slaughterhouse and saves 2,000 dogs. Chinese man spends $400K to buy Slaughterhouse and saves 2,000 dogs. 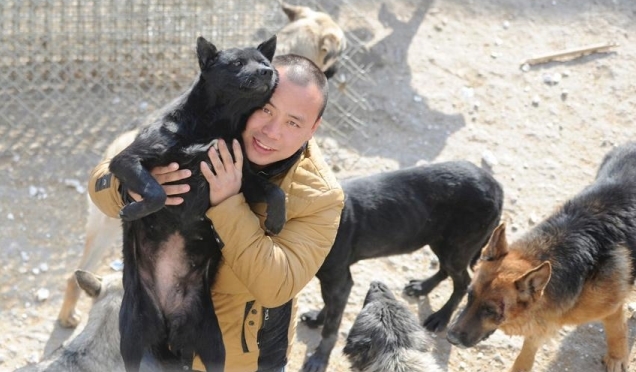 In order to save hundreds of dogs from the slaughterhouse, a former Changchun millionaire has gone broke founding an animal rescue center that helps to find local strays a loving home. 29-year-old Wang Yan, from Gelong town in Jilin province, once had a net worth of several million yuan. But he has since given it all away, in a journey that started one day in 2012 when his beloved pet pooch went missing. "I went looking everywhere, but all to no avail," he remembers. "Finally someone let me go into the slaughterhouse to try my luck there." According to Sina News, Wang hung around the slaughterhouse for a week, but was unable to find his lost dog. Instead, he found scenes of bloody slaughter that he was unable to shake from his mind. After that experience, Wang used his fortune to buy the slaughterhouse and establish an animal shelter inside an abandoned steel factory. Over time, he gradually built up the shelter, finding more and more homes for strays. "Right now, we only have 215 dogs," he said. "The most we've had at one time is 1,000, many of them have been adopted." 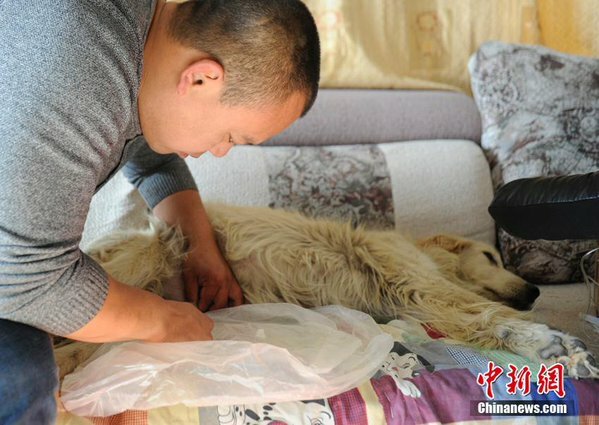 Wang Yan and his family spend a lot of time in the station, feeding the dogs and clean their shelter every day. Responses to "Chinese man spends $400K to buy Slaughterhouse and saves 2,000 dogs." Wang Yan - you are a WONDERFUL human being! Thank you for saving all these dogs! Your reward will be great, I am sure... if not in this life, then in the next. I'll bet the dogs, themselves, have already rewarded you with their love! I personally believe there should be no slaughterhouses for dogs, and no dog meat for human consumption. I find that totally despicable! Thank you for doing what you can to help these wonderful companions! YOU, sir, are a HERO. Thank you. God bless you for being so kind and compassionate. You have some beautiful dogs there!!!! Hope they will find their forever homes! Thank you for all you are doing!!! Were it not for massive over population of China and having so many mouths to feed, resorting to what we in the west consider abhorrent dietary practices, by eating domesticated pets this likely wouldn't be a problem. There are many "dishes" in the Asian or Oriental diet that the protein is from animals not utilized in the west or even in the other parts of the globe such as felines and monkeys. While we may not find even the concept particularly palatable, I would presume if or when you are hungry enough, you‘d eat almost anything. This is not to say that I don’t admire Wang Yan for the actions he took on behalf of the dogs in the slaughterhouse because I most certainly do and I appreciate the continued support he has shown them since. Many might have considered what he did in buying the slaughterhouse enough and walked away, but he has followed his heart and accepted responsibility for the lives he saved. Even at great personal expense. Hopefully, others will take up his cause and pitch in to help him with the expenses. Fantastic. What a wonderful man. Good luck to him. Maybe he could make money by selling some dogs or set up a fund for donations to keep up the shelter and upkeep of these animals. He is a wonderful soul and human being. The way a person should be. We need more human beings like you. I wish you all the best and I hope that others will follow in your footsteps. You are a Hero! Thank you for being our light in this world. I wish all good fortune to you and your family. Mr. Wang Yan, thank you for being a much needed role model in todays world, for your compassion and committment. It is people like you that are leading the growing movement to kindness and caring. You are wished all the help you need and long life in good health. Man of the century! HERO. Go fund Me. Lets start a fund for this guy. Need an address. A million thank yous...please Mr. Yen start a non-profit organization to help fund the dog food, beds and blankets. Maybe start a volunteer program to have people come help you clean and care for the dogs. There are ways people will help you for free! Start a FaceBook page and network! I'd help you if I was there! You have good karma coming, don't you worry! He is a wonderful human being. I do not agree with one comment though, that he should sell dogs, because you can never be sure of who a buyer is. Haven't we seen enough examples of that on Craig's list? This world needs more people like Mr. Yen. He is no doubt a very special man, but to go into debt is ridiculous. Now he has no investments to keep money coming in and won't be able to save more dogs, let alone feed what he has. I just don't understand this kind of behavior. Now others won't be save. too bad. You are definitely a hero and a saint. Thank you so, so much for saving all these dogs. Their love is unconditional. You have unconditional love as well. Thank you from the bottom of my heart. Great Guy!!! God will bless you!!! Can I please come live there and help take care of these animals? Brilliant man! What a heart! Thank you so very much from Australia. In order to continue to fund your great work..... social media will help! Jesteś wpaniałym człowiekiem! Dziękuję! thank you!! Thank you so much! You are a wonderful, great man!! I am sorry you loss your pet! You have a big heart, and I admire a man who cares so much for animals!! Thank you!! What a wonderful thing you have done. The way some of the population treats dogs over there is beyond disgusting (torture them, kill & eat the dogs). May God bless you. I am sure people around the world would love to help (donate) if you are out of funds. The atrocities done there and around the world to animals must end . You not only saved these dogs but you only saved countless human hearts that suffer every day with the knowledge of the these horrific practices. Thank you sir. You put a light in my heart. GOOD KARMA,,,THE UNIVERSE WILL PAY IT BACK TO YOU IN MILLION WAYS....THANK YOU THANK YOU !! Yan == you're the best === keep it up! still there is hope for china thank you. What a wonderful example of true human kindness. Thank you Wang Yan. My fervent wish is that humanity extends such compassion to ALL animals - dogs, cats, chickens, sheep/lambs, cows/calves, pigs/piglets, monkeys, orangutans, bears, seals, lions, tigers, goats, wolves... the list of animals goes on and on. Every one of them deserves to live, whether they are pets, wild animals or farmed animals. There is no difference. They all love their babies. They all feel pain. Thank you for your compassion for animals. I just read this and I think you understand it Then. Questioner: "How should we treat others?" Indian Sage Ramana Maharshi: "There are no others"
Thank you so much! You are my hero! If there is anything I can do to help you as a Veterinary Assistant, I would love to volunteer. You are incredible. Thank you and your family, for being exceptional human beings. You are an exceptional man, especially coming from china where the values for Dogs are not equitable. GOD BLESS YOU and he will!!! You are amazing....your money was well spent and your soul is forever free now. OMG...he's gonna go straight to heaven... a truly elevated soul! Incredibly outstanding. A rare person indeed. Reading this yesterday, I just had to come back again today. I am so grateful that we have people like you in this world. Much love from NY, USA. Your commitment to save these dogs is beyond commendable. I hope you can also bring attention to the fact your people and other Asians purchase ivory and ground-up rhinoceros horns in the mistaken belief it will help their medical ailments. Bless you for the rest of your life. "These things we do; that others may live". Thank you so much for living by this motto and may you and your loved ones enjoy a blissful lifelong journey together filled with love, peace and good health! Wow what a legend an absolute hero I wish more people where like this. Mr. Yan, you are the antithesis of the evils that China too often perpetrates on animals and I thank you for what you have done for so many dogs. I am sorry you did not find your dog-sometimes good comes out of hard times. I have seen too many pictures of dogs in meat markets and it is painful. I do not like to see suffering of any animals and do what I can for them. Thank you for saving so many dogs . In every country there are good people who care and you are one of them.